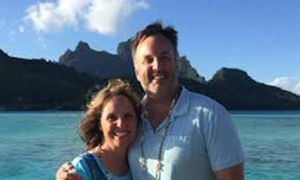 Chasity and Jason are from Illinois, the loving parents to a young son, planning a romantic anniversary trip to get away, relax, and simply love the moment in paradise. We were delighted to put together an itinerary for them that included gorgeous hotels, jaw-dropping scenery and amazing excursions. So the little one was taken to Grandma’s and off they went, on the trip of a lifetime! 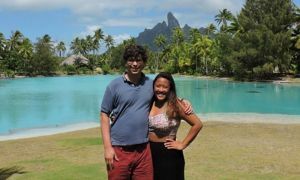 Chasity: We had been wanting to come to Bora Bora for some time and knew this trip would be expensive and we knew it would also be the trip of a lifetime! ...I started doing a lot of research and literally lived on Trip Advisor for about a year before we actually came here. 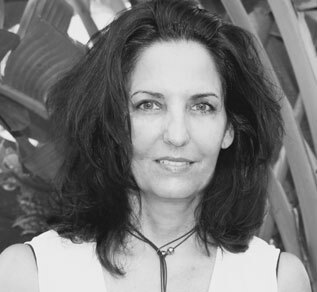 I studied reviews and travel books to find the best place to stay and like a lot of people, debated for a while between the Four Seasons and the St. Regis. We ultimately ended up going with the Four Seasons for a couple reasons: It is rated #1 on Trip Advisor, we heard customer service was better at Four Seasons, and when looking at pictures I liked the grounds and pool area views better at the Four Seasons and I also liked the rooms and bathtub that open out to the gorgeous views! Now that we have gone, we truly feel like we made the right decision. 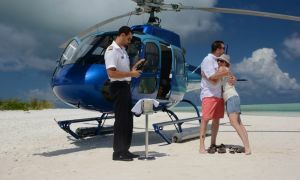 From the boat pickup at the airport all the way to the drop off we had phenomenal service and felt very pampered! When we arrived we were greeted by name and no waiting in the lobby. We hopped on a golf cart with all our luggage and were whisked away to our Overwater Bungalow which was huge, very clean and sooo nice! 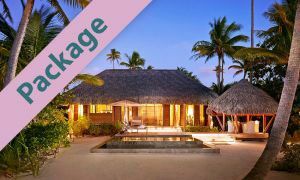 … We were already in love with the Four Seasons Bora Bora right from the start! A couple of my favorite things were the service at the pool and beach area, they always make sure you have ice cold water and there is free water everywhere, also the different flavored slushies that they walked around handing out at the beach and the pool, that was an awesome idea whoever came up with that, delicious and so refreshing! I also loved the room service and the sunset bar which we did go to every day at sunset for a couple cocktails and the scrumptious chips and salsa that they bring along with your drinks. Everywhere you turn is beautiful scenery and the grounds, bathrooms, restaurants everything was really clean and well kept, definitely felt luxurious. We actually stayed on Moorea for the first 4 days of our trip, at the Hilton Moorea Lagoon Resort which was great. 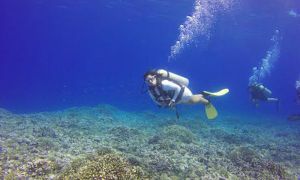 We did the AVT / Adventure tour and had a lot of fun. 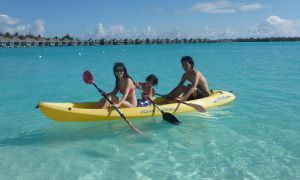 But when we went to Bora Bora the Four Seasons truly blew us away!" 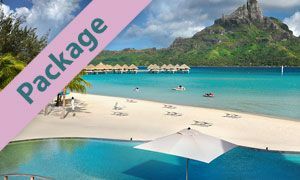 We booked our travel through Pacific for Less as I searched around and got quotes from about 6 different travel agencies and Pacific for Less gave the same things for the cheapest price out of all the quotes we received! We got double upgraded with a mountain view bungalow - not sure if the upgrade was the Four Seasons doing or if the travel agency worked their magic but needless to say we were pleasantly surprised! Pacific for Less made things really easy, all we had to do is show up. 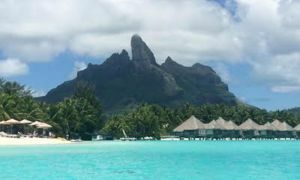 We loved the excursions that they booked for us, the AVT / Adventure tour on Moorea, the private Lagoon Cruise & Photo Safari with The Love Boat on Bora Bora, and above all the Motu Tapu Lagoon Tour with Shark & Ray feeding experience - one of the best excursions I have done anywhere! Thank you the Four Seasons Bora Bora for being perfectly amazing! 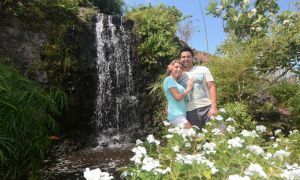 We absolutely enjoyed every minute of our stay. 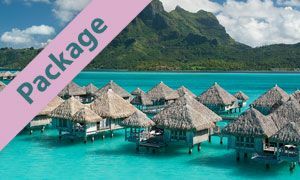 Staying at the Four Season Bora Bora, I could go on and on about it…The service at the pool and beach was my favorite! Our daily cocktails at the Sunset Bar! We loved the scrumptious chips and salsa that they bring along with your drinks. 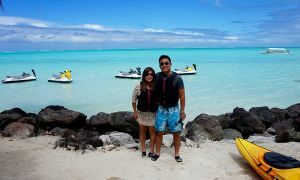 The Motu Tapu Lagoon Tour with Shark & Ray feeding experience - one of the best excursions I have done anywhere! At the Four Seasons Bora Bora try the different flavored slushies they hand out at the beach and the pool, delicious and so refreshing! 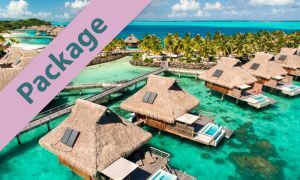 On Moorea, at the Hilton Moorea Lagoon Resort, get a bungalow all the way out by the end next to the rooms with the plunge pools. Includes a free night, daily breakfast buffet, chilled Champagne in your suite upon arrival, fresh fruit selection & mango coullis, complimentary WiFi, and roundtrip Airport-Hotel-Airport Transfers. 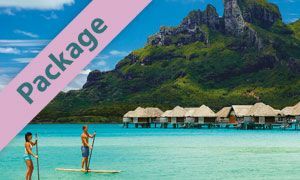 Additionally includes the Motu Tapu Lagoon Tour with a Shark & Ray Experience for two as a gift from Pacific For Less.